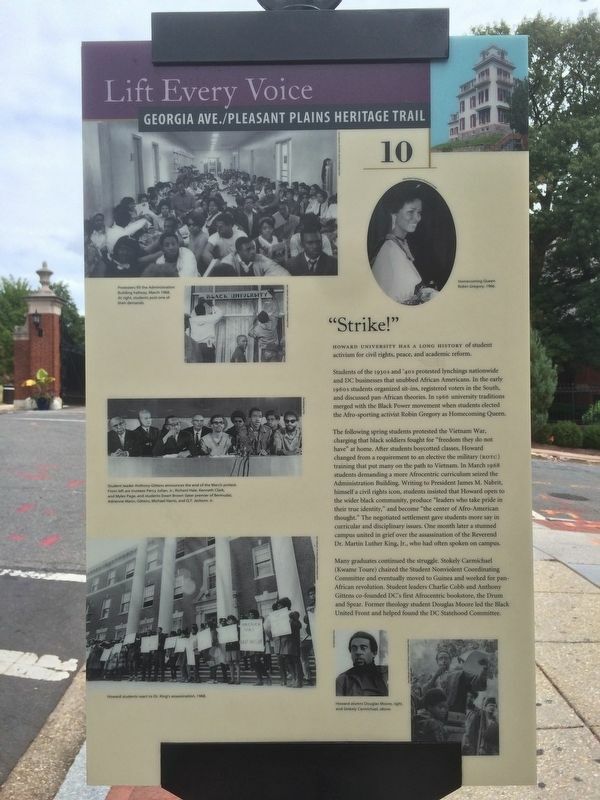 Howard University has a long history of student activism for civil rights, peace, and academic reform. Students of the 1930s and '40s protested lynchings nationwide and DC businesses that snubbed African Americans. In the early 1960s students organized sit-ins, registered voters in the South, and discussed pan-African theories. In 1966 university traditions merged with the Black Power movement when students elected the Afro-sporting activist Robin Gregory as Homecoming Queen. more say in curricular and disciplinary issues. One month later a stunned campus united in grief over the assassination of Reverend Dr. Martin Luther King, Jr., who had often spoken on campus. Many graduates continued the struggle. Stokely Carmichael (Kwame Toure) chaired the Student Nonviolent Coordinating Committee and eventually moved to Guinea and worked for pan-African revolution. Student leaders Charlie Cobb and Anthony Gittens co-founded DC's first Afrocentric bookstore, the Drum and Spear. Former theology student Douglas Moore led the Black United Front and helped found the DC Statehood Committee. Homecoming Queen Robin Gregory, 1966. Protesters fill the Administration Building hallway, March 1968. At right, students post one of their demands. Student leader Anthony Gittens announces the end of the March protest. From left are trustees Percy Julian, Jr., Richard Hale, Kenneth Clark, and Myles Page, and students Ewart Brown (later premier of Bermuda), Adrienne Mann, Gittens, Michael Harris, and Q.T. Jackson, Jr.
Howard students react to Dr. King's assassination, 1968. Howard alumni Douglas Moore, right, and Stokely Carmichael, above. 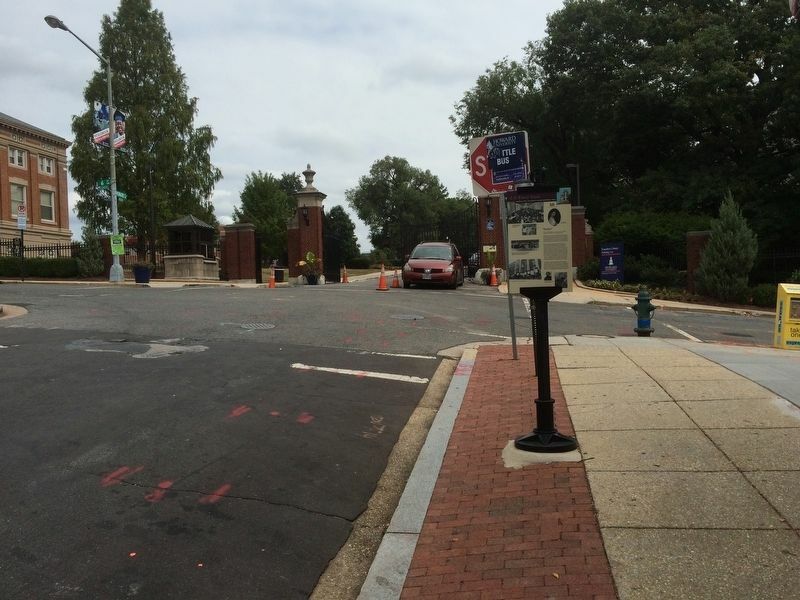 The main entrance to Howard University can be seen in the background in this view to the east. its heart once beat to jazz riffs and the eager steps of people dressed in their finest. Here swept aromas once wafted from commercial bakeries. Just north of Florida is where hot Saturday afternoons meant Griffith Stadium, the crack of the bat and shouts of baseball-mad crowds. And Georgia continues. It climbs toward Howard University, the historical heart of our country’s African American intellectual community. Farther still, brick temples of learning give way to rowhouses and storefronts, and the steady beat of everyday life. 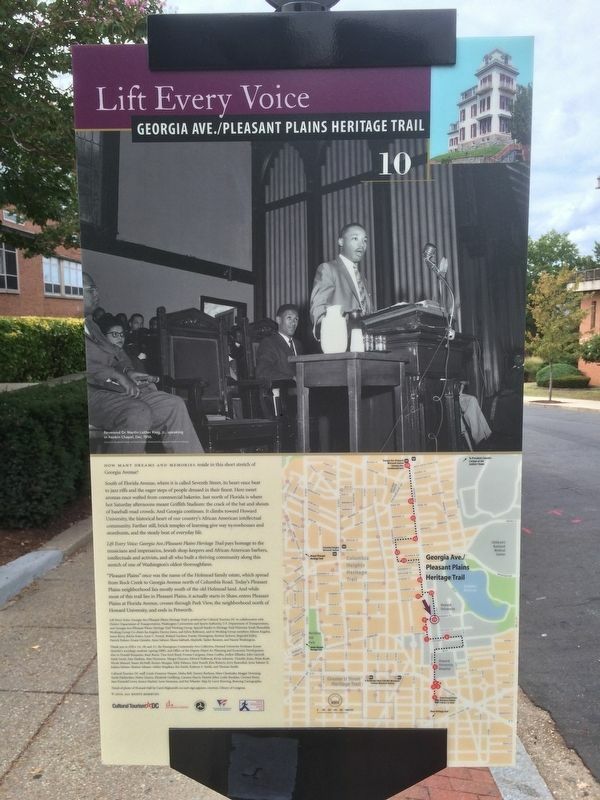 Lift Every Voice: Georgia Ave./Pleasant Plains Heritage Trail pays homage to the musicians and impresarios, Jewish shop-keepers and African American barbers, intellectuals and activist, and all who built a thriving community along this stretch of one of Washington's oldest thoroughfares. Caption: Reverend Dr. Martin Luther King, Jr., speaking in Rankin Chapel, Dec. 1956. Scurlock Studio Record, Archives Center, National Museum of American History. Location. 38° 55.344′ N, 77° 1.272′ W. Marker is in Pleasant Plains, District of Columbia, in Washington. Marker is at the intersection of Howard Place Northwest and 6th Street Northwest, on the right when traveling east on Howard Place Northwest. Touch for map. Marker is at or near this postal address: 2400 6th Street Northwest, Washington DC 20059, United States of America. Touch for directions. Other nearby markers. At least 8 other markers are within walking distance of this marker. Howard University (a few steps from this marker); Andrew F. Hilyer Residence Site (within shouting distance of this marker); Day of Honor 2000 (within shouting distance of this marker); Howard Hall (within shouting distance of this marker); General Oliver O. Howard (about 300 feet away, measured in a direct line); Tau Beta Pi (about 300 feet away); Zeta Phi Beta Sorority, Inc. (about 300 feet away); Teachers and Preachers (about 300 feet away). Touch for a list and map of all markers in Pleasant Plains. More. Search the internet for "Strike!". Credits. This page was last revised on March 16, 2019. This page originally submitted on November 4, 2016, by J. Makali Bruton of Querétaro, Mexico. This page has been viewed 448 times since then and 19 times this year. Last updated on March 7, 2019, by Devry Becker Jones of Washington, District of Columbia. Photos: 1, 2, 3. submitted on November 4, 2016, by J. Makali Bruton of Querétaro, Mexico.